The perfect landscape – soothing or vibrant, brilliant or subdued – emerges from an artful use of nature’s elements. Plants, shrubs and trees need a range of conditions to thrive: proper soil, correct moisture and drainage, sun or shade or both. The right plant is the correct size and shape and provides just the right amount of shade at maturity. All plant materials should make each other shine because they go together well, colors complement other colors and the landscape has something green growing all year long. Evergreen plants and shrubs provide fill-in color when other plants drop their leaves, and flowers with different blooming times add color for long periods. Variety adds interest, texture and sensory delights. Too much variety, however, creates chaos and sensory overload. Carefully chosen native grasses can be wonderful accents to a formal landscape, but indiscriminate mixes of styles and species can look like a freeway pileup. Gardens with straight or curved perimeters, plants, shrubs and trees of varying heights, rock gardens, formal gardens or the English garden’s organized disorganization with abundant wild flowers – whichever you choose, the style and shapes should be repeated throughout. As with the architectural style of a home and its value, the landscape should be a pleasing addition to the personality of the neighborhood. Even the most formal landscape can be environmentally friendly, with plants and gardens that nurture nature. Native plants, trees and gardens attract wildlife and even add to habitat. Enlarged natural or mulched areas can replace high-maintenance lawns. Residential and commercial landscapes alike can be designed in harmony with nature. My Botanica welcomes the opportunity to answer your questions, provide information about how to create a distinctive design in harmony with nature and help you choose products that are kind to nature’s gifts. Please call toll free 1-888-722-4308. Landscape design embraces the principles of fine art to shape a mural in concert with nature. A good design is a work of art, a sculpture that reflects an interplay of color, skillful use of texture and expert knowledge of plant materials. The final touches of the artist’s work pull the elements together to create beauty in an environmentally friendly way. The result is a masterpiece on Mother Nature’s canvas, one that pleases the senses and reflects personal preferences. 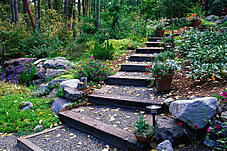 An experienced landscape designer considers many factors, such as how the land will be used. Grand outdoor entertaining? Intimate social gatherings? Family fun, with barbecues, lawn games and children’s play area? The answers help direct the design lines and choices of plant materials. For example, trees and shrubs can shape outdoor “walls” to create a secluded garden for private quiet time. Grassy areas offer open space for lawn games and may be used to direct attention to the home or building. A well-designed landscape also complements the “hardscape” – driveways and motor courts, walkways, pools and pool decks, for example. Beauty within the landscape plan includes the use of proper plant materials. Native plants, near natives and ones that have adapted to the growing conditions of a particular area not only thrive, they require far less maintenance than other plants, trees and shrubs. The most successful landscapes incorporate the proper materials in the proper places with the proper growing conditions. My Botanica’s team of professionals welcomes the opportunity to answer your questions, provide information about how to create a distinctive design and help you choose the best products for your landscape and garden projects. Please call toll free 1-888-722-4308.